I mentioned in this post last week that we weren’t going to get an elf on the shelf and then, we did and our mornings haven’t been quite the same ever since. The kids have had a blast trying to find “Jolly’s” new hiding space every morning. We only have 7 days left before Jolly packs his bags and heads back home to the North Pole we are going to enjoy each and every second! I wonder what he will do this week? 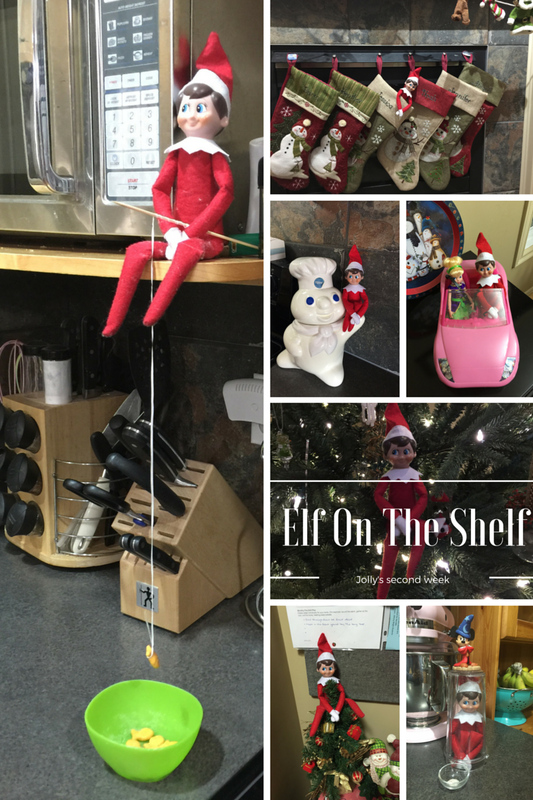 So, where has our Elf on the shelf been hiding this week? We noticed Tuesday evening that Jolly with a heart sticker stuck to his eye. I’m not sure if you are familiar with “the rules” but in order for the Elf to keep his magic and be able to return to Santa every night the children are not allowed to touch him. I remember seeing Jessica playing with the stickers over by Jolly so I had assumed that she had tagged our little Elf on the Shelf friend. She professed her innocence over and over again but, we didn’t believe her. It was only then that I glanced at Noah that I caught his expression and realized we were questioning the wrong child… These things never seem to happen on a night when you have no plans and this night was no different. I had a dental appointment to go to and two children freaking out that their Elf was “dead” and would never return. So, after a quick google search we learned that we can save “Jolly’s” magic with a bowl of cinnamon and an apology letter. Do you have an Elf on the Shelf? What creative places has your Elf been hiding? You have some cute ideas! We have an Elf on the Shelf that sometimes forgets to move, so we have to come up with excuses. 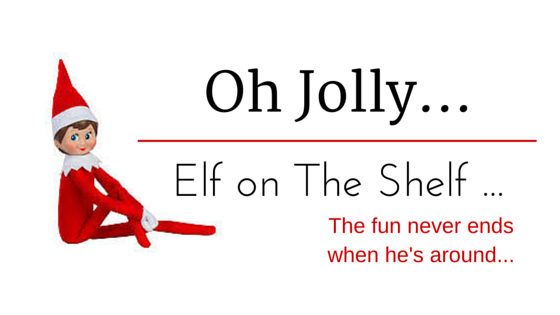 I’m totally in love with all these Elf on a Shelf ideas! We don’t have one but I’m totally doing this next year. 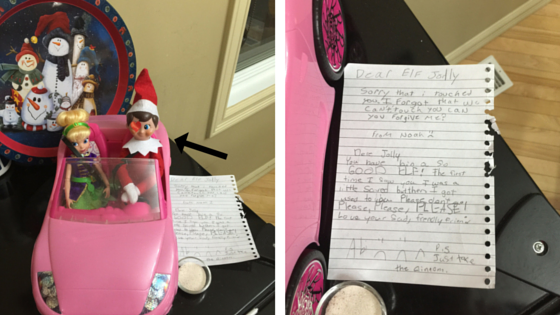 We don’t do elf on the shelf, but your ideas are super cute! I love the goldfish one! Very cute idea. My son loves to do Elf on the Shelf. If we don’t have an elf or two out, he makes sure to dig one out of the Christmas boxes. This is something I never experience as a child so we don’t have a tradition for this. I see many moms does this though and it look so much fun. Cute ideas for Mr. Elf on a Shelf. We dont have one but love the idea. Elf and Barbie has to be my favorites. I’ve debated on getting an elf on the shelf. They do look like a lot of fun. It sure looks fun to come up with different scenarios and mischief he can get into. I know the kids must love this so much! You found some creative spots for the elf! I am always worried we won’t be able to find any where good for the elf to be at. There are so many cute Elf on the Shelf ideas here. I love the one of him fishing for goldfish. It is such a cute idea. My kids would love seeing the elf doing that! I’m totally stealing your elf fishing set up. We are running out of ideas (and frankly, energy) so it is great to get some inspiration from other bloggers! I love Elf on a Shelf ideas. He looks so cute fishing! We are on our 5th year with Snowy and I am totally running out of new and creative ideas for him. Love what you do with your elf.